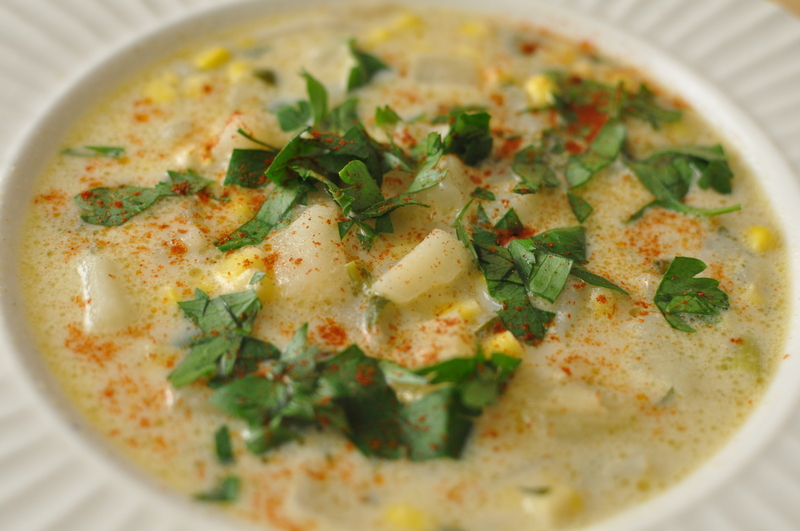 I’m going to admit that up until I made this corn chowder I had never really been interested in eating, let alone preparing, chowder of any kind. It’s not something my mom used to make and I find myself leery of seafood in soup form (I know this is irrational, but I’ve never really connected with shell fish in a way that could lead to a future culinary relationship, in fact I can’t stomach eating most things from the sea with a shell.) The other week I went to the library and took out the book Love Soup by Anna Thomas (author of The Vegetarian Epicure – a sophisticated little cookbook with many beautiful recipes) and as I looked through the pages that all seemed to promise an exceptionally satisfying final product I saw a recipe for corn chowder with aged cheddar. 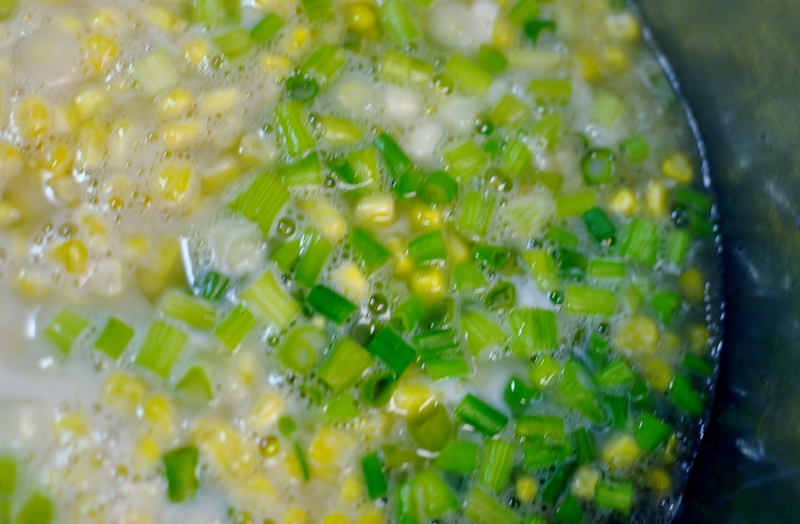 Now I’m not sure if it was the fact that the onions are caramelized before being added to the soup or my constant craving for late-August corn (which this version sadly does not contain), but I decided to try this recipe. I’m so happy I did because this is one my new favourite soups; it doesn’t at all match up with my preconceived notions of chowder which I would describe as a gloppy off-white substance served with saltines, best eaten while wearing an oversized wool sweater and galoshes. This chowder is light, fresh, and heavily speckled with summer green and yellow; serve it with warm multigrain bread spread with salted butter and a simple green salad. 1. Over medium-low heat caramelize the sliced onions in the oil and butter. I cooked mine for about a half an hour, slightly less than I would have if the onions weren’t going to be put into a soup. 2. Meanwhile, making sure that the potatoes have been well scrubbed (leaving the skin on) dice into small cubes and place in a large soup pot along with 3 cups of water, the bay leaf, sage, and seal salt. Bring to a boil and summer for 5 minutes. 3. When the onions are done add them to the potatoes in addition to the remaining ingredients except for the cheese; allow to come to a boil and then simmer for about 10 minutes. 4. Finally, add the cheese but be careful not to let the soup boil as it may curdle if allowed to come to a high temperature. Serve in shallow bowls with fresh bread and a green salad. While I was making this colourful summer chowder I managed to successfully creep myself out by listening to the film score for the Alfred Hitchcock movie Vertigo loudly while I chopped onions. Vertigo is my all-time favourite film but it I will always find it thoroughly unsettling to watch and Bernard Herrmann’s often excruciatingly tense and haunting score is in my opinion the whole backbone of the film’s ambience (I think this is true for most of Hitchcock’s work.) Seeing as this score makes me feel terrified I’m not entirely sure what my explanation is for listening to it while cooking such a bright recipe, I’d like to think that the food ended up balancing out the mood of the music after all was said and done.